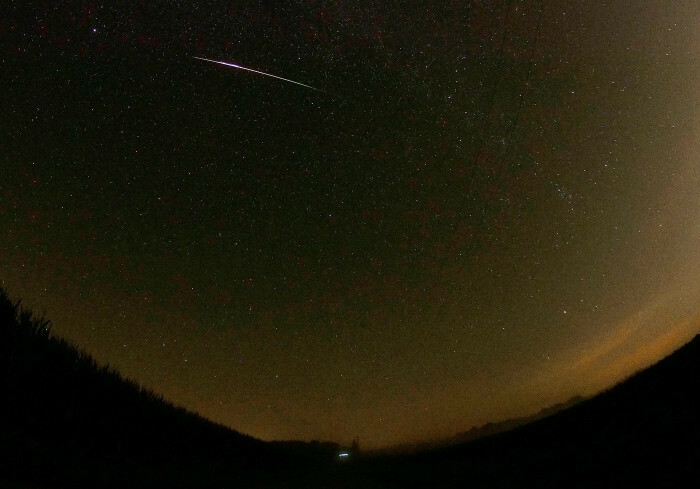 “The most spectacular [Perseids] since at least 2008,” eh? I packed up some blankets, a tripod, a camera rarely used, a flashlight that has a crank on the side so you’ll never need batteries again, a can of bug spray with a broken top nozzle, a tiny can of Perrier, the girlfriend who loves to sip them. Ding! It’s that easy when you concentrate on in-the-moment enjoyment and just randomly jam on the camera shutter a few times. Fewer than 19 frames total! We tried reclining in the car with the moonroof open, but there’s not nearly enough sky visible. Leaning against the car while standing is a classic pose for a reason. And these meteors were plentiful! We called it quits around 1:30 a.m., but not before witnessing a good many bright streaks, faint blips and everything in between for 45 minutes. Fog rolled in midway, adding a very sinister effect when paired with Peoria’s light pollution. My accidental frame was captured and we threw everything back in the car and attempted the deer avoidance dance to get back to beds and not enough sleep. A perfect night with one hiccup. I have one/two Micro Four Thirds cameras with lenses and I’m beginning to absolutely hate them. The focusing for most is fly-by-wire – and impossible in darkness. Some controls are physical, but too many are still buried in menus that invoke the light of a million suns with every click. I finally settled on a manual-focus fisheye that got the job done. It’s been over three years since I became management at the newspaper and ended my shooting days. Time to buy my own dSLR for the first time since 2004. Portability is pointless when an iPhone will do 95% of the time. 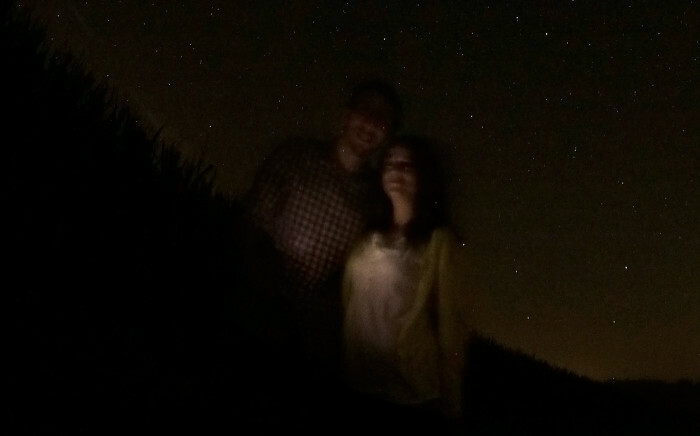 Thanks for humoring me with the Perseids, Katie. They appreciated the attention. One my my favorite memories of Hays (and ever) was watching a meteor shower in single digit temps on a school night in a corn field. Painfully cold, but incredible. Thanks for sharing the your Perseid experience!